This experience is based at shared accommodation in the wonderful beachside hamlet of Gnarabup. Participants will have access to their own twin share bedroom (single supplement for own room available), shared living spaces and shared bathroom facilities. Your walk includes stunning and wild coastal landscapes, physical challenge, new friendships and gourmet evening meals await you. Experience the finest local produce including Lamont’s Cafe, The Common Bistro, Cape Grace Vineyard, Vasse Felix Estate, The Larder, Margaret River Farmers Market, and a superb 6 course degustation dinner at Margaret River’s No. 1 restaurant – Miki’s Japanese Open Kitchen. Our professional, local guides have extensive knowledge and experience interpreting the natural beauty of the Track. And you can enjoy all this long distance walk has to offer without carrying a heavy pack. There are also ample options for half day / rest day if you feel the need – it is your holiday:)! Accommodation: A private beach house in Gnarabup, on the coast of beautiful Margaret River, Includes spacious shared common areas and bathroom facilities. Cape to Cape Explorer Tours specialise in providing memorable experiences on the world-renowned Cape to Cape Track. Our highly qualified local guides and managing director are friendly, energetic and entertaining, with a wealth of knowledge to share about the geology, ecology, biodiversity, culture and history of the Track. Enjoy the insights and discussions that will add a whole extra layer of meaning to your journey – stimulate your muscles and mind! Enjoy this long distance walk in good company and with peace of mind: safety is our priority. Our fully-trained guides carry first aid and emergency communications equipment. Margaret River is renowned for fresh, healthy produce – and wine! Savour delicious and nourishing meals and track snacks prepared for you each day; indulge in boutique wine, olive and cheese tastings. Refresh your body with a dip in the ocean and sleep well in your comfortable lodgings amidst the gorgeous natural surroundings of Gnarabup Beach. Cape to Cape Explorer Tours is an environmentally responsible and conscientious operator: we live here and we know, love and support this coastline. While the focus is on walking the Track, our little surprises and extras will make this a trip to remember! Enjoy complimentary morning pick up from Perth in Cape to Cape Explorer Tours’ transfer vehicle straight down to begin walking from Cape Naturaliste, the first section of the Cape to Cape Track begins with a gentle down hill stroll on the ‘access-for-all’ section of track to the stunning vistas of Sugar Loaf Rock. The Track then runs along an extended section of carved limestone sea cliffs before reaching the coastal hamlet of Yallingup – ‘The Place of Love’. From Yallingup pass over the granite headland at Torpedo Rock and on to the fabled Smiths Beach. After Smith’s Beach the topography changes quickly as giant granite marbles dominate near Canal Rocks. Travel high over the ridge and past Rotary Lookout, before dropping back down on to the beach at Injidup. Travel up high over the ridge, through the coastal tee tree and back onto the wild south-west facing coast. Weave through stunning areas of limestone cliff and granite before walking through the stunted vegetation and granite fields of Moses Rock. The Track rises high over several large limestone headlands before flattening out on Willyabrup Beach. A wonderfully constructed staircase then guides walkers up and onto the stunning sea cliffs that form the famous climbing buttresses of Wilyabrup Cliffs. After passing the cliffs, the Track drops back down onto the beach, passing the famous, though severe, surfing breaks of Gallows and Guillotines. The coast then turns decidedly rocky as it ducks and weaves over picturesque granite boulders and finally into the pretty hamlet of Gracetown. Relax here and enjoy an afternoon swim to sooth the muscles and mind! Beginning at the picturesque hamlet of Gracetown, follow the low coastline to thehistoric settlement of Ellensbrook. From Ellensbrook, the Track quickly leaves thecoast and meanders through sand dunes and past Ellensbrook homestead and Meekadarbee Falls. Visit the isolated coves of Gnoocardup and torquoise bay of Kilcarnup. Marvel at the centuries-old osprey nest in Horseshoe Bay and then take in some of the world's finest surfing coastline at Prevelly. (although we may be biased as CCET have adopted and maintain this leg!) Enter the majestic Karri forest, home to the world’s third tallest hardwood! A longer day, but the solid track under foot and afternoon shade of the karri forest make it all seem easy! Start amongst the tall karris of Boranup Forest, home to an array of wildlife and wildflowers in season. Head south, back into the coastal heath, and down onto the stunningly beautiful Boranup Beach. 7kms of sand walking later, find the protected Hamelin Bay, home to some of the Cape’s friendliest stingrays who love a feed of freshly caught fish! Continue on past the many islands and headlands through the coastal heath and past Foul Bay lighthouse until you arrive at the stunning Cosy Corner. The last leg of the Cape to Cape Track faces more into the south than the rest of the coast. True wilderness with limited road access the sights are reserved for the local hooded plovers and you. Granite headlands are broken up by long sections of shoe-sucking sand. Formidable, but every step takes you closer to the Cape Leeuwin lighthouse and the moment of celebration. 9am we depart for Perth via the Margaret River Farmer’s Market in the Cape to Cape to Cape Explorer Tours Bus. Complimentary transfers between our central pick up points in Perth* / the Perth Airport and Margaret River. 7 x days fully-guided walking, with full emergency support: trained guides carry first aid and communications equipment. Twice-daily vehicle transfers between the Track and accommodation. 7 x nights accommodation in twin-share beachside accommodation. 6 x evening meals including one night 6 course Japanese degustation at award winning Miki’s Open Kitchen; the final night’s celebration dinner at a local restaurant is not included. Alcoholic beverages are not included, but opportunities will be provided for you to visit local wineries and purchase beverages of your choice. A selection of your walking experiences’ best photos will be collected during the week, will be burnt to DVD and distributed to you after your walk free of charge. Cape to Cape Track completion certificate. All planning, logistical, administrative and on-ground support, including intimate knowledge of weather patterns, creek crossings and Track conditions. The itinerary will remain flexible to ensure you safely and comfortably experience the best of the Cape to Cape Track – and get everything you wish for from your holiday. We request a 30% deposit to confirm the booking and secure accommodation. Final payment is required 4 weeks before the trip commences. Payments can be made by direct deposit; please email info@capetocapetours.com.au for bank details and booking terms and conditions. Why choose Cape to Cape Explorer Tours? At Cape to Cape Explorer Tours we pride ourselves on creating the highest quality Cape to Cape Track experience available. We are the Cape to Cape Track specialists! An award-winning, local company, we support the Track and our community. 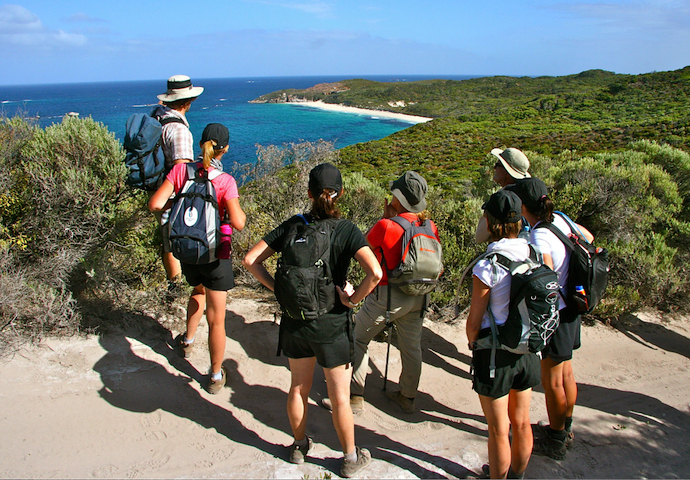 Our guides and staff all live in the area, are professionally trained and have an intimate knowledge of the Track and the Margaret River region, not to mention a passion for walking. We deliver personalised and quality service – a fun, healthy holiday with great food, accommodation, company, scenery and a wonderful sense of accomplishment! Your safety and satisfaction is our priority and our attention to detail and love of looking after all the ‘little things’ has led to many repeat customers and glowing reviews. We look forward to welcoming you to Margaret River and sharing the natural wonders of the region – especially the Cape to Cape Track, with you in 2015 and beyond!